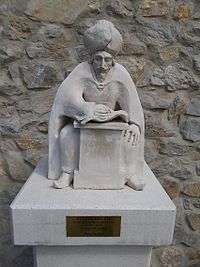 Mehmed Zilli (25 March 1611 – 1682), known as Evliya Çelebi (Ottoman Turkish: اوليا چلبى‎), was an ethnically Abkhazian Ottoman explorer who travelled through the territory of the Ottoman Empire and neighboring lands over a period of forty years, recording his commentary in a travelogue called the Seyahatname ("Book of Travel"). Evliya Çelebi was born in Constantinople in the year 1611 to a wealthy family from Kütahya. His father was Derviş Mehmed Zilli, an Ottoman court jeweller, and mother an Abkhazian relation of the Ottoman grand vizier Melek Ahmed Pasha. In his book, Evliya Çelebi traces his paternal genealogy back to Khoja Akhmet Yassawi. Evliya Çelebi received a court education from the Imperial ulama. He may have joined the Gulshani Sufi order as he shows an intimate knowledge of their khanqah in Cairo, and a graffito in which he referred to himself as Evliya-yı Gülşenî ("Evliya of the Gülşenî"). A devout Muslim opposed to fanaticism, Evliya could recite the Quran from memory and joked freely about Islam. Though employed as clergy and entertainer to the Ottoman grandees, Evliya refused employment that would keep him from travelling. His journal writing began in Constantinople, taking notes on buildings, markets, customs and culture, and in 1640 it was extended with accounts of his travels beyond the confines of the city. The collected notes of Evilya Çelebi's travels form a ten-volume work called the Seyahatname ("Travelogue"). He fought the House of Habsburg in Principality of Transylvania. Evliya Çelebi died sometime after 1682: it is unclear whether he was in Istanbul or Cairo at the time. According to Evliya Çelebi, the name Mostar means "bridge-keeper." Of the bridge, 28 meters long and 20 meters high, Çelebi wrote that "the bridge is like a rainbow arch soaring up to the skies, extending from one cliff to the other. ...I, a poor and miserable slave of Allah, have passed through 16 countries, but I have never seen such a high bridge. It is thrown from rock to rock as high as the sky." Çelebi claimed to have encountered Native Americans as a guest in Rotterdam during his visit of 1663. He wrote: "[they] cursed those Jesuits, saying, 'Our world used to be peaceful, but it has been filled by greedy colonialists, who make war every year and shorten our lives.'" While visiting Vienna in 1665–66, Çelebi noted some similarities between words in German and Persian, an early observation of the genetic relationship between what would later be known as two Indo-European languages. Çelebi visited Crete and in book II describes the fall of Chania to the Sultan; in book VIII he recounts the Candia campaign. Of oil merchants in Baku Çelebi wrote: "By Allah's decree oil bubbles up out of the ground, but in the manner of hot springs, pools of water are formed with oil congealed on the surface like cream. Merchants wade into these pools and collect the oil in ladles and fill goatskins with it, these oil merchants then sell them in different regions. Revenues from this oil trade are delivered annually directly to the Safavid Shah." Evliya Çelebi remarked on the impact of Cossack raids from Azak upon the territories of the Crimean Khanate, destroying trade routes and severely depopulating the regions. By the time of Çelebi's arrival, many of the towns visited were affected by the Cossacks, and the only place he reported as safe was the Ottoman fortress at Arabat. A man who had not seen this market, had not seen anything in this world. A mother is severed from her son and daughter there, a son—from his father and brother, and they are sold amongst lamentations, cries of help, weeping and sorrow. In 1667 Çelebi expressed his marvel at the Parthenon's sculptures and described the building as "like some impregnable fortress not made by human agency." He composed a poetic supplication that the Parthenon, as "a work less of human hands than of Heaven itself, should remain standing for all time." Although many of the descriptions the Seyâhatnâme were written in an exaggerated manner or were plainly inventive fiction or third-source misinterpretation, his notes remain a useful guide to the culture and lifestyles of the 17th century Ottoman Empire. The first volume deals exclusively with Constantinople, the final volume with Egypt. Currently there is no English translation of the entire Seyahatname, although there are translations of various parts. The longest single English translation was published in 1834 by Joseph von Hammer-Purgstall, an Austrian orientalist: it may be found under the name "Evliya Efendi." Von Hammer's work covers the first two volumes (Constantinople and Anatolia) but its language is antiquated. Other translations include Erich Prokosch's nearly complete translation into German of the tenth volume, the 2004 introductory work entitled The World of Evliya Çelebi: An Ottoman Mentality written by University of Chicago professor Robert Dankoff, and Dankoff and Sooyong Kim's 2010 translation of select excerpts of the ten volumes, An Ottoman Traveller: Selections from the Book of Travels of Evliya Çelebi. Evliya is noted for having collected specimens of the languages in each region he traveled in. There are some 30 Turkic dialects and languages cataloged in the Seyâhatnâme. Çelebi notes the similarities between several words from the German and Persian, though he denies any common Indo-European heritage. The Seyâhatnâme also contains the first transcriptions of many languages of the Caucasus and Tsakonian, and the only extant specimens of written Ubykh outside the linguistic literature. İstanbul Kanatlarımın Altında (Istanbul Under My Wings, 1996) is a film about the lives of legendary aviator brothers Hezârfen Ahmed Çelebi and Lagâri Hasan Çelebi, and the Ottoman society in the early 17th century, during the reign of Murad IV, as witnessed and narrated by Evliya Çelebi. Çelebi appears in Orhan Pamuk's novel The White Castle, and is featured in the The Adventures of Captain Bathory (Dobrodružstvá kapitána Báthoryho) novels by Slovak writer Juraj Červenák. Evliya Çelebi ve Ölümsüzlük Suyu (Evliya Çelebi and the Water of Life, 2014, dir. Serkan Zelzele), a children's adaptation of Çelebi's adventures, is the first full-length Turkish animated film. United Nations Educational, Scientific and Cultural Organization, UNESCO included the 400th anniversary of Evliya Celebi's birth in its timetable for the celebration of anniversaries. Evliya Çelebi. Evliya Çelebi Seyahatnâmesi. Beyoğlu, İstanbul: Yapı Kredi Yayınları Ltd. Şti., 1996-. 10 vols. Robert Dankoff: An Ottoman Mentality. The World of Evliya Çelebi. Leiden: E.J. Brill, 2004. Klaus Kreiser, "Evliya Çelebi", eds. C. Kafadar, H. Karateke, C. Fleischer. October 2005. Evliya Çelebi in Diyarbekir: The Relevant Section of The Seyahatname. Trans. and Ed. Martin van Bruinessen and Hendrik Boeschoten. New York : E.J. Brill, 1988. 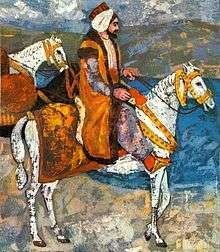 The Intimate Life of an Ottoman Statesman: Melek Ahmed Pasha (1588–1662) as Portrayed in Evliya Çelebi's Book of Travels. Albany: State University of New York Press, 1991. Narrative of travels in Europe, Asia, and Africa, in the seventeenth century, by Evliyá Efendí. Trans. Ritter Joseph von Hammer. London: Oriental Translation Fund of Great Britain and Ireland, 1846. Im Reiche des Goldenen Apfels. Des türkischen Weltenbummlers Evliâ Çelebis denkwürdige Reise in das Giaurenland und die Stadt und Festung Wien anno 1665. Trans. R. Kreutel, Graz, et al. 1987. Ins Land der geheimnisvollen Func: des türkischen Weltenbummlers, Evliyā Çelebi, Reise durch Oberägypten und den Sudan nebst der osmanischen Provinz Habes in den Jahren 1672/73. Trans. Erich Prokosch. Graz: Styria, 1994. Evliya Çelebis Reise von Bitlis nach Van: ein Auszug aus dem Seyahatname. Trans. Christiane Bulut. Wiesbaden: Harrassowitz, 1997. Manisa nach Evliyā Çelebi: aus dem neunten Band des Seyāḥat-nāme. Trans. Nuran Tezcan. Boston: Brill, 1999. Evliyā Çelebis Anatolienreise aus dem dritten Band des Seyāḥatnāme. Trans. Korkut M. Buğday. New York: E.J. Brill, 1996. Helena Turková: Die Reisen und Streifzüge Evliyâ Çelebîs in Dalmatien und Bosnien in den Jahren 1659/61. Prag 1965. Luciano Rocchi: Tra guerra e diplomazia. Un viaggiatore turco nella Dalmazia del Seicento. Passi scelti dal Seyahatname di Evliya Çelebi. Trieste: IRCI, 2008. 1 2 "Saudi Aramco World : The Unread Masterpiece of Evliya Çelebi". saudiaramcoworld.com. Retrieved 2014-10-27. ↑ Robert Dankoff, An Ottoman Mentality: The World of Evliya Çelebi, BRILL, 2004, ISBN 978-90-04-13715-8, p. xii. ↑ "Saudi Aramco World : Hearts and Stones". saudiaramcoworld.com. Retrieved 2014-10-27. ↑ Fisher, A. (1998). Between Russians, Ottomans and Turks: Crimea and Crimean Tatars. Isis Press. Retrieved 2014-10-27. ↑ Mikhail Kizilov. "Slave Trade in the Early Modern Crimea From the Perspective of Christian, Muslim, and Jewish Sources". Oxford University. p. 24. ↑ Stoneman, Richard (2004). A Traveller's History of Athens. Interlink Books. p. 209. ISBN 9781566565332. ↑ Holt, Frank L. (November–December 2008). "I, Marble Maiden". Saudi Aramco World. Saudi Aramco. 59 (6): 36–41. ↑ "Anniversaries celebrated by Member States | United Nations Educational, Scientific and Cultural Organization". portal.unesco.org. Retrieved 2014-10-27. Wikimedia Commons has media related to Evliya Çelebi.